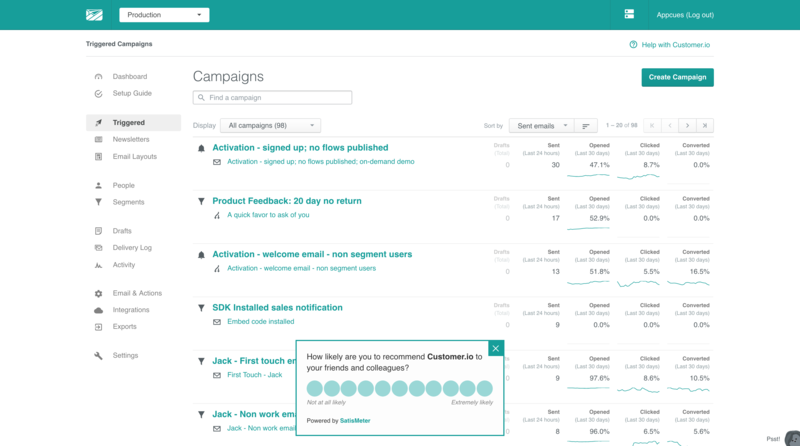 Customer.io is an email automation tool that also comes with robust analytics capabilities. Users can send relevant campaigns while also running experiments, like A/B tests, so they can constantly iterate and improve. With all the email automation tools out there, Customer.io seeks out customer feedback via an NPS survey to gain insight into how they can retain and expand their user base. Rather than pop up in the middle of the screen, Customer.io's NPS survey pops up at the bottom, without interrupting whatever the user is doing. Once a user accomplishes their current task, they can address the NPS survey. This is a classic NPS example in its simplicity and form. Customer.io made it easy for a user to rank their experience and move on with using the app.